One of today’s three senior football fixtures involving local clubs has succumbed to the weather. Westfield’s scheduled trip to Steyning Town in Macron Store Sussex County Football League Division Two has been postponed due to a waterlogged pitch. But Hastings United’s game away to Guernsey in Ryman Football League Division One South and Little Common’s match at Wick & Barnham United in Sussex Division Two are scheduled to go ahead. Common’s second team fixture at home to Seaford Town in Sussex Reserve Section (East) is off, but Bexhill United’s trip to Lancing and Westfield’s game at home to Southwick in the same division are on. Some of the Macron East Sussex Football League programme has been affected, yet most of it looks likely to get the green light. Already-crowned champions St Leonards Social will look to complete their season with a 100% record as they take on second-placed Hollington United at Tilekiln. Ryman League, Division 1 South (7.45): Guernsey v Hastings Utd. Macron Store Sussex County League, Division 2: Steyning Town P Westfield P; Wick & Barnham Utd v Little Common. Reserve Section (East): Lancing v Bexhill Utd; Little Common P Seaford Town P; Westfield v Southwick 2. National Christian Cup, 3rd round (11.45): Battle Baptists v Kings Sports. Macron East Sussex League (2), Premier Division: Hollington Utd v St Leonards Social; Iden P Peche Hill Select P; Ninfield Utd v Ore Athletic; Sedlescombe Rangers v Rock-a-Nore. Division 1: Icklesham Casuals P Hollington Utd II P; Mountfield Utd v Wadhurst Utd; Sidley Utd v Hawkhurst Utd. Division 2: Catsfield P Wittersham P; Crowhurst v Herstmonceux. Division 3: Hastings Rangers v AFC Hastings; Peche Hill Select II v Hooe Sports; Visick v Ninfield Utd II. Division 4: Bexhill Utd III v West Hill Utd; Little Common III v Peasmarsh Utd; St Leonards Social II v Bexhill AAC II; Westfield III v Bexhill Rovers. Division 5: Magham Down v AFC St Leonards; Mayfield v Battle Baptists II; JC Tackleway II P Sedlescombe Rangers II P; Wittersham II P Ticehurst II P.
Division 6: Hawkhurst Utd II P Hampden Park Utd P; Robertsbridge Utd II P Battle Baptists III P; Sandhurst II v Icklesham Casuals II; Sedlescombe Rangers III v Orington. 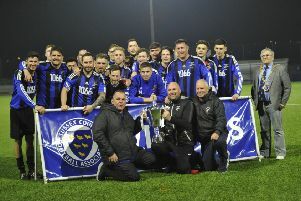 Hastings & District FA Junior Cup quarter-finals (1.30): Pebsham Sibex v Bexhill AAC; Ticehurst P JC Tackleway P.
Hastings & District FA Lower Divisions Cup quarter-final (1.30): FC Westridge P Burwash P.
Eastbourne FA Junior Cup semi-final (1.30): Willingdon Athletic II P Punnetts Town II P.